Spring is just around the corner. Got a pup that loves your garden? This is her girl dog collar! 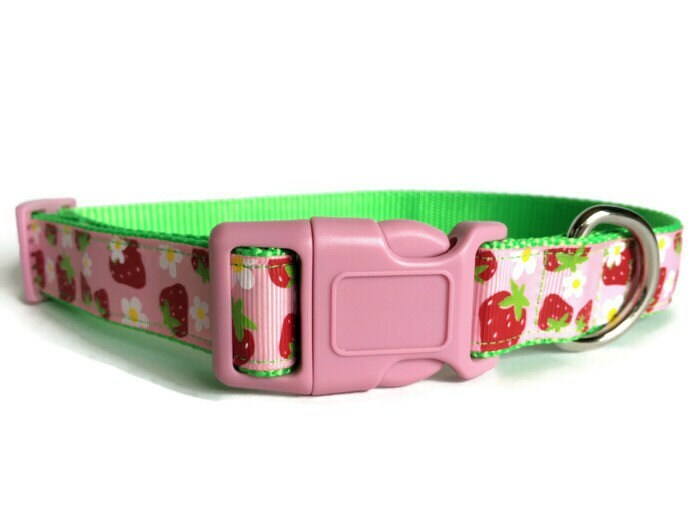 This country chic themed adjustable dog collar is made with a pink grosgrain 7/8" ribbon that features a strawberry and daisy design that is attached to 1 inch hot green heavy-duty nylon webbing using interfacing and high-quality thread (triple sewn on pull-points).The hardware is plastic (a contoured, quick-release buckle and slip-lock) and a welded nickle D-ring.